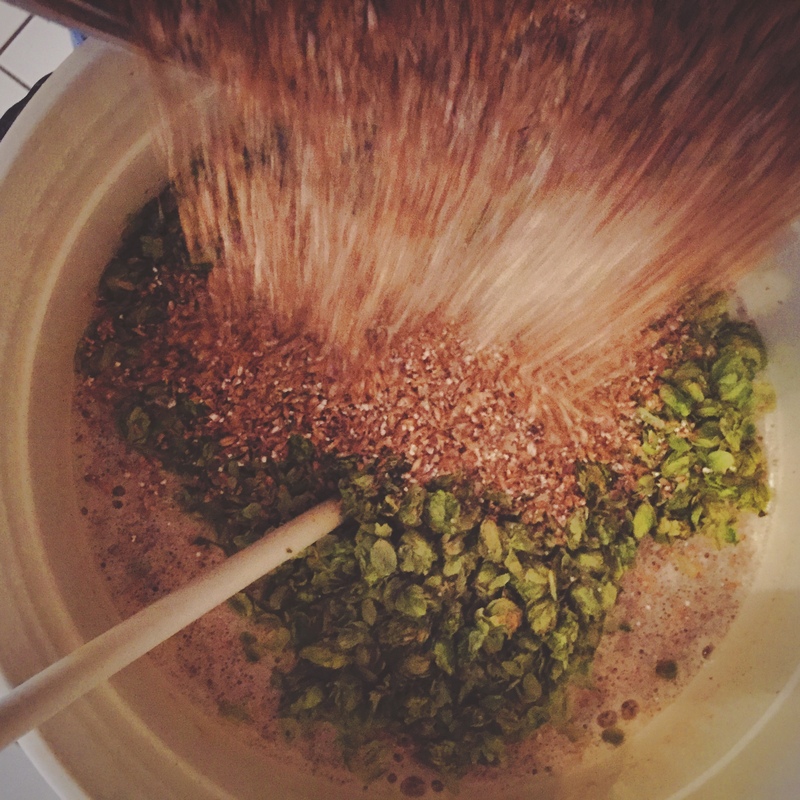 Some local hopheads and myself got to chatting about doing a double IPA keg party with a bit over a month’s lead time, so I thought I’d take what I learned from 047 and tweak. My thinking on IPA hopping right now is that there are two broader flavour profiles I could be shooting for: citrus and pine, or fruity. With 047 I combined hops from both categories, but I decided this one should be all about the Citra and Mosaic for a big juicy fruitiness. Once again, this was a strictly no boil hop brew, instead using mash hops for bittering and a hop stand for aroma. A bit more variable than the past few batches, likely due to inconsistent thermometer placement. After going a bit low last time I used a hotter strike temperature. The mash profile ended up averaging something like 151F for the hour, but once again the mash took longer than expected, I’m wondering if mash-hopping somehow inhibits enzymes. I also adjusted my hop stand to be quite a bit shorter to avoid the DMS issues the last batch had; instead of a half hour, I cooled a bit and did a 12m and a 4m addition before chilling. Fermentation went quickly enough, I got it down to a nice dry 1.007 after 11 days, which is when I dropped in the first round of dry hops and cold crashed. I’m not convinced keg hopping is working for me, so I moved forward over half of my dry-hopping schedule to the carboy to see what difference it made. And what a difference; the sample a week later was absolutely the best beer I’ve brewed yet, by a long shot. It had a perfect balance of fruity juiciness with a strong edge of dank to cut through it. I was so happy with it that I transferred, hit it with gelatin, and added the rest of the dry hops as it carbonated. And that’s where things went a bit south. The day after, it went from perfect to grassy; I added more dry hops mainly for the sake of aroma as the flavour was exactly what I wanted, but they really threw off the flavour balance. Over the next week I took samples every few days; the grassy edge mellowed down, and this smoothed out to something that was excellent, if not quite as revelatory as it was before the second addition. On drinking, it’s pretty clear that this one doesn’t benefit from the extra ABV at all; next time I can drop the sugar down a bit to target the 7-8% range with no flavour impact. 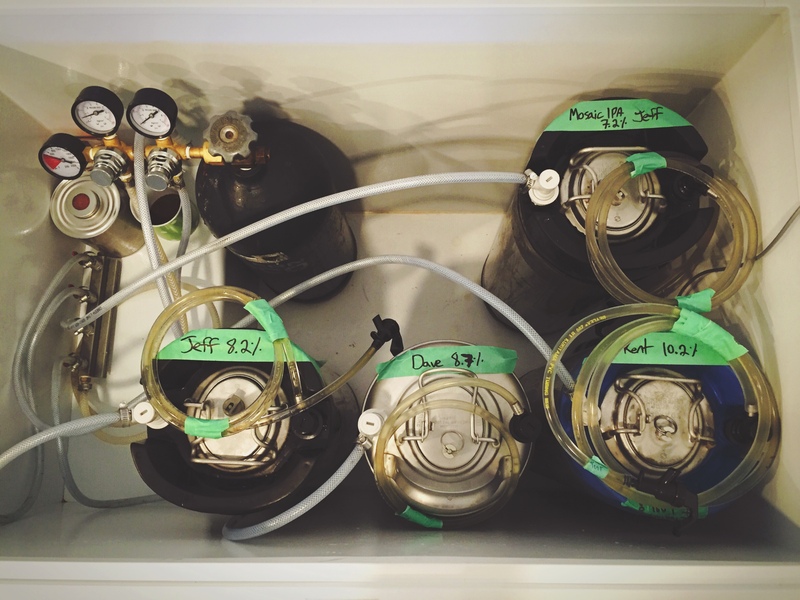 The keg party happened 5 weeks after brew day, and this beer was ready for it. Alongside a couple of fantastically well-done local homebrew batches, it held its own. It was nice to have a more Simcoe/C-hop forward beer to compare against, that confirmed my feeling about the flavour profiles.